How can I get rid of Little Leaf Notcher Weevil that are eating my mango's leaves? I found those white bugs destroying a mango tree and now they started invading an orange tree. The little leaf notcher weevil is one tough pest to control. Reason is that the immature larvae infest the soil, and the adults crawl up the trunk and feed on the leaves. There is no easy solution to this problem other than either calling local arborist who can properly identify the weevil and then apply a product called Brigade WSB to the leaves and trunk, and then apply an egg sterilant called Micromite 80WGS to the soil. Both of these products have to be applied at intervals during the summer months to get control. It is not a 1 time treatment. The problem for homeowners is that these 2 products are Restricted Use and cannot be sold to persons without a pest control license. There are 2 alternatives however. The cheap alternative is to use Orthene Tree and Ornamental Spray. The best alternative is to use Zylam Liquid Systemic. 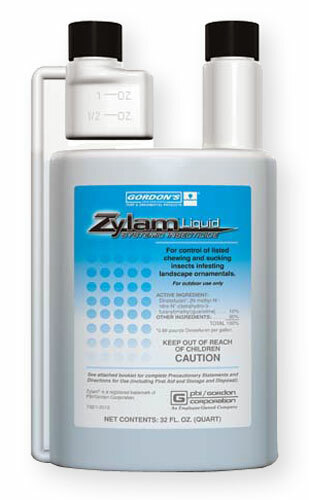 Zylam can be used to spray the tree and used to treat the soil to kill the immature larvae. It will not sterilize the eggs. There is a very good discussion on treatment of Little Leaf Notcher Weevils on the University of Florida website here.